Anyone ever tell you that you can be OK with not being OK? That was my take home message from a recent weekend yoga retreat. I can’t tell you how much better it made me feel. Then there are the tangible things that make you feel better—such as this Freekeh Frittata filled with roasted vegetables, giving every bite a pleasing burst of flavour. Lightly brush vegetables with a tablespoon of olive oil, seasoned with a little sea salt and freshly ground black pepper, then grill at 400F for 15-20 minutes. Add the cheese, zest, parsley, dill, salt and pepper to the eggs. Spray a 9×13-inch casserole with a little olive oil. Spread the freekeh on the bottom. Layer on most of the grilled vegetables. 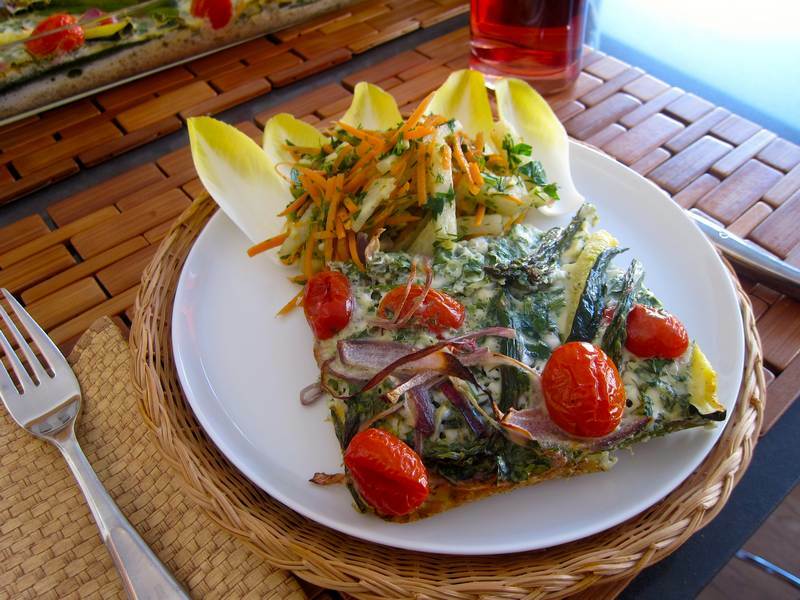 Spread the egg mixture over the vegetables, topping the frittata with the remainder of the vegetables. Bake for 35 minutes, until the top is set. Let cool for 10 minutes before serving. Serves 6. Serve with Jicama Carrot Salad. Combine ingredients in a large bowl and toss with Sherry Dijon Vinaigrette. Serves 6. In a small bowl, combine shallots, garlic, vinegar and salt. Add mustard. Slowly add oil while stirring with a fork. Happy Mother’s Day! 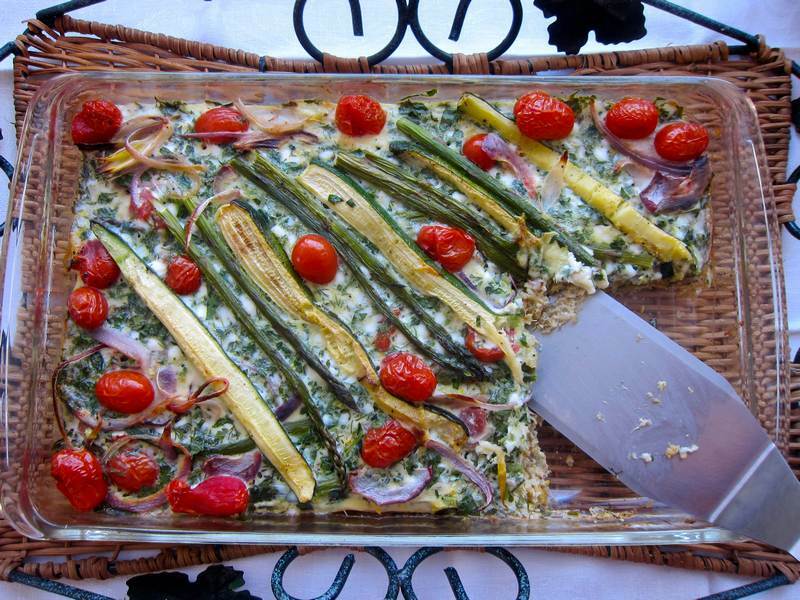 Serve Freekeh Frittata or follow one of these 25 Mother’s Day brunch suggestions. If you are looking for a good dessert, how about these 20 Jittery Desserts? It does sound fabulous. I love it! Thanks Darya! I worry about the loveability if what I love. Nice to know there’s two of us! Well, I would never have thought of it myself, but I like the idea of using a grain in an omelette. And I just love the taste of freekeh and all those veggies. Plus I am dreaming about a yoga retreat these days, so I guess that made me even more open to liking the recipe that came with your mentioning it. It’s all good! 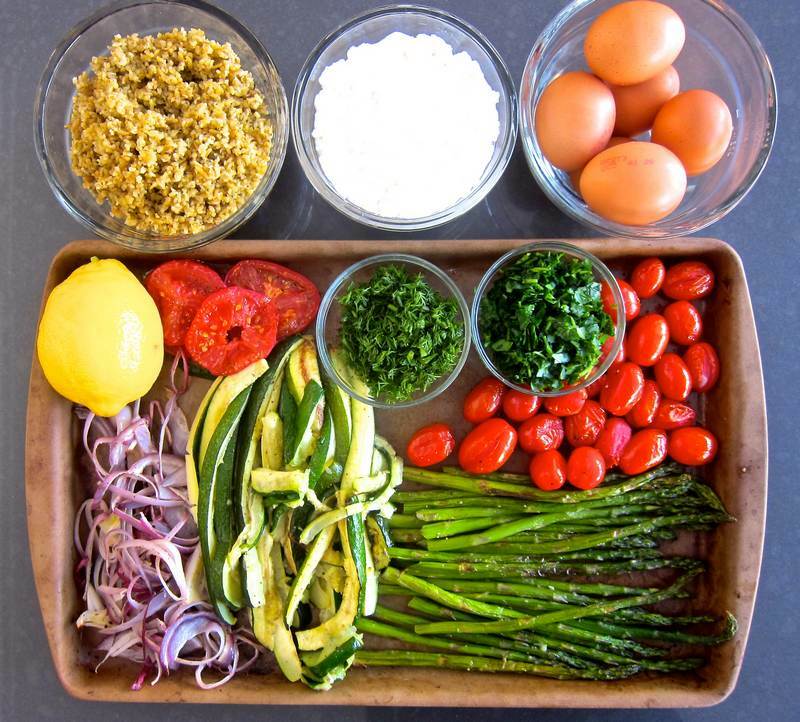 Yoga, freekeh, roasted veggies….great combo. Thanks Jovina! Looks good, tastes better!